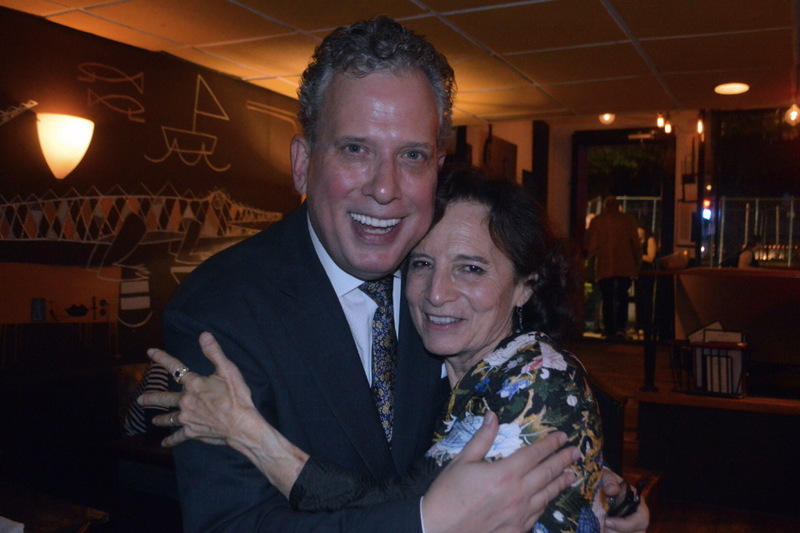 Home » Music Reviews » Pretty Close to Perfect – Michele Brourman at Pangea! Pretty Close to Perfect – Michele Brourman at Pangea! There is nothing I enjoy more than my own enjoyment, so describing a performance I absolutely loved, like Michele Brourman’s at Pangea, is as good as it gets. Brourman has been making music since the age of three. She’s written and produced the songs for 18 animated features for Universal Studios, including the beloved “Land Before Time” series, and her theater accomplishments include the scores for “Dangerous Beauty” and “The Belle of Tombstone.” Her best-known composition, “My Favorite Year,” has been recorded by Michael Feinstein, Dame Cleo Laine and frequent collaborator and “best bud” Amanda McBroom. Michele Brourman composes melodic seductive songs in minor keys with sensuous diminished chords and danceable tempos that encourage tripping the light fantastic, etc. etc. 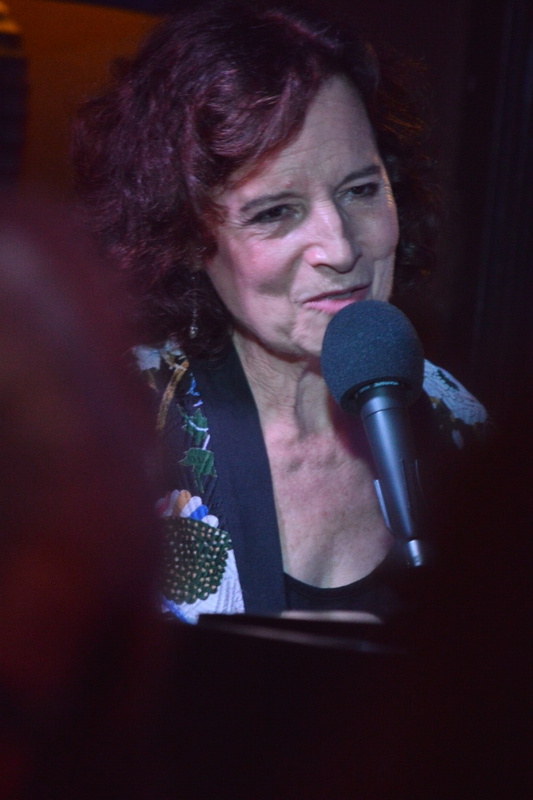 Brourman also writes clever, heartfelt lyrics and last, but hardly least, she inspires top drawer lyricists like Amanda McBroom, Sally Mayes, Karen Gottlieb and her sister Robin Brourman Munson to supply rhymes for her tunes which have been performed by numerous luminaries across the globe. But nothing compares to hearing a song sung by the composer. In her debut at Pangea she demonstrates superb, diverse musical taste with selections that vary between touching and sparkling to laugh out loud funny. Her wit, charm and engagement take an audience along on an unforgettable ride. She need never hold a candle to anyone. She’s someone you’ll never tire of seeing. She endears herself to the audience immediately, admitting, “I get nervous when I hear applause until I look around I see the room and see it filled with people I love.” And I might add, obviously love her back. Her opening three numbers are all Brourman. “Let’s Order In,” also the title of the show, has a Latin beat and a sophisticated lyric which explains clearly why they shouldn’t go out … hem, hem… but order in. “Consolation Prize” has a country and western lilt, lyric and theme about a woman who lost her man … “but twisted her tears into a tune and got herself a song.” The conclusion? The gal who got the man got the short end of the stick. “Orange Blossoms” is a shimmering, sensuous lush melody with lyrics that make you remember how it felt to be “dizzy with you… a memory that softly strums across the skin, a ripple of what might have been, a thrill of orange blossoms.” The lyrics certainly inspired the gent sitting across from me who delicately stroked his lady’s silver sequin blouse while certainly imagining future delights. Of the five Brourman melodies, with lyrics by Amanda McBroom, my favorites included the self-explanatory “You’re Only Old Once,” which hit the spot but “Voter’s Prayer,” addressed to members of Congress rocked the room. It could easily be selected #metoo’s anthem. Keep it in your pants, won’t you keep it in your pants? So, exercise some self-control and save it for your wife. They put de goose pluckin’s in a big ol’ sack and shake it all around, And what comes down is feathers, and what goes up is down. Ditto re newspaper ink, what is black is read. One last thought. My actual pre-entertainment delight began even before Michele Brourman arrived on stage, thanks to the pleasing, reasonably priced Sauvignon Blanc I sipped while nibbling on Romesco-sauced al dente asparagus spears from Pangea’s remarkable kitchen, which made as good as it gets even better.